I know, that title is a mouthful to say. Don't even get me started. It was going to be, "Vegan, Gluten-free, Egg and Dairy free, Refined sugar free, Double Chocolate Cake with Vanilla Date Sauce". I finally thought to myself, enough is enough...and shortened it...just a tad. I mean, could you imagine those words across the picture? It would literally be a page of words. You wouldn't be able to see the dang cake! Ha! What a sight. I'm not going to lie. This recipe took work to make blog-ready. The first time I made it, it went straight into the trash. Oy! That was a heart breaker. All that time! All that money! In the trash. Grrrr. But, I was determined to make this work because I really wanted more special dietary restriction friendly, unprocessed, real desserts and foods up on SLBS for you guys. I find these types of recipes fascinating. The weirder the ingredients, the more excited I become! It's like science! Cooking science! Like the sauce for example- by combining dates, water, chia seeds, applesauce and vanilla together, you end up with something tasty! That just blows my mind! Where's the butter...or coconut oil? It needs a fat! And the sugar? Needs something right? Honey, maybe? Nope. It totally works (and is a little bit addictive). Don't be intimidated though- this cake is definitely worth the little bit of planning ahead that you'll have to do. 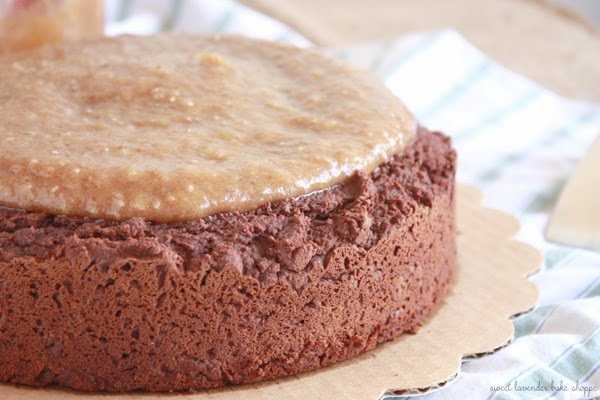 Using dates and applesauce as the sweetener, and melted chocolate in the batter, this cake becomes slightly fudgy, lightly sweet, and totally unprocessed. It's a feel good dessert you, and any special-diet-following-friend and/or family member can truly enjoy. That's kind of neat right? Although it may seem like a lot of ingredients and a weird combo at that, they work. They just do. They're easy to find too- I purchased all of the ingredients from my local Trader Joe's! Hmmm, maybe not the unsweetened baking chocolate- I think I got that from Target. For this cake you'll need 1 full package of Trader Joes' fresh dates (in the fresh fruit section)- I think the plastic carton is 16 ounces worth? So pick up one of those along with the rest of these yummy things and you're good to go! I also always use my own homemade vanilla extract. Filled with only vanilla beans, their seeds, and good quality vodka, I know it's the purest form I can get. Don't have that? No sweat- just get the best quality you can find. Always use the best vanilla extract possible in your recipes, it really does make all the difference! To start this whole process, you'll need to soak your Vanilla Date Sauce's dates overnight. So, in a bowl with a tight fitting lid (or you can just use plastic wrap), add your cup of pitted dates and 3/4 cup boiling hot water. Stir to distribute, cover, and allow to sit on counter overnight. 1. Preheat oven to 350°F and spray an 8" cake pan with cooking spray. Line the bottom with a circle of parchment paper, and lightly spray again. Here's an example of what I mean by this. I always, always prepare my cake pans this way. Makes sure your cake never sticks! This will make a pretty tall one layered cake (as you can see in the picture). If you'd like, you can also prepare two 9" cake pans, should you want two thin layers for a layered cake. Just divide the batter equally and bake cakes with less time. 2. In a small glass dish over a pot of simmering water, melt your chopped up unsweetened chocolate. Stir occasionally until smooth. Set aside to cool a tad. 3. While that is cooling, add your almond milk, applesauce, dates, maple syrup, and vanilla extract to a high powered blender or food processor. Blend until completely smooth, about 2-3 minutes. Next, scrape down sides and add slightly cooled melted chocolate. Blend again until smooth and incorporated. 4. In a large bowl, whisk together the flour, cocoa powder, baking powder, baking soda, and salt. Pour your date mixture into your flour mixture and stir and fold together until combined. Batter will be very thick. 5. Once fully mixed, add mixture to your pan(s) and smooth out top so it reaches all the sides and is relatively flat. 6. Bake cake in the middle of your oven for about 45 minutes, turning pan 1/2 way through baking to ensure even cooking. Cake is done when it has risen and a toothpick inserted in the middle comes out almost clean- and with crumbs. Do not over bake. 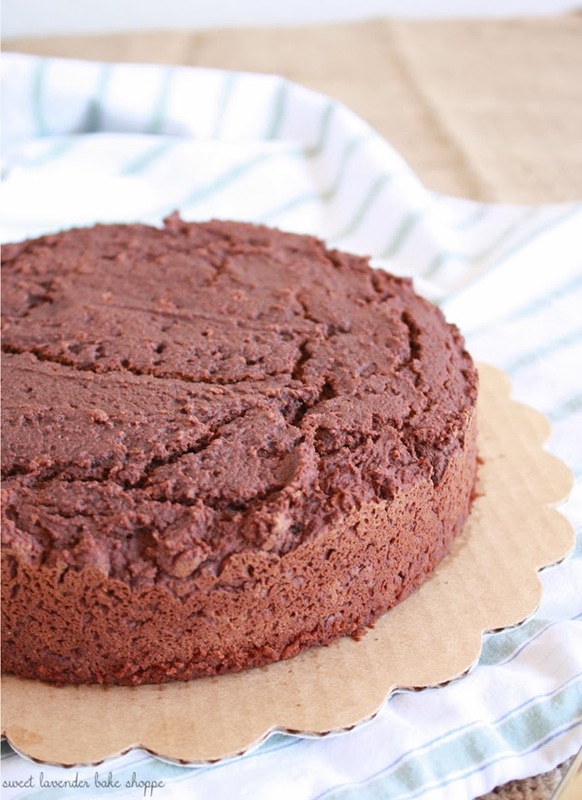 Let cake sit in pan for 10 minutes to cool before inverting it onto a platter or plate to cool completely. Try not to move it too much once inverted out of pan. Let cake cool completely before adding the Vanilla Date Sauce. 1. After your dates have soaked overnight, combine them (and their liquid), the chia seeds, the vanilla extract, and the applesauce into a high powered blender or food processor and puree completely- about 2-3 minutes. Allow sauce to sit 45 minutes to an hour on the counter before using, to allow it to fully set up. Sauce will store in an air-tight container, in the fridge, for up to 5 days. Top cake with your sauce right before service. Or, slice up cake and serve with a spoonful or two of sauce right on the plate. Do not sauce cake way in advance as it could cause your cake to become too moist and fall apart. Cake is best eaten day it is made. OooOo! You know what?? 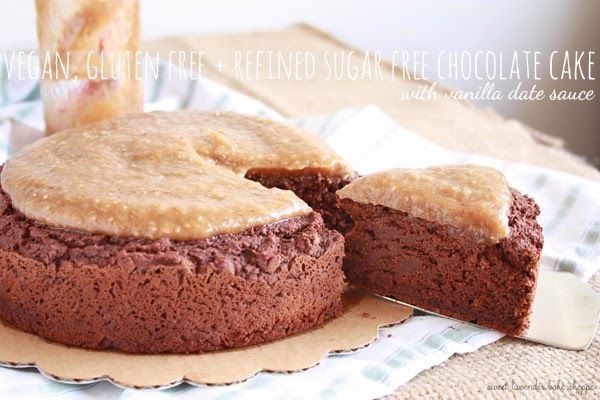 This dessert would also be amazing if served alongside some delicious vegan coconut whipped cream! Holy cow, I need to try that next time. That would compliment the chocolate and date sauce so well! Can't wait for you guys to try this! Such a fun thing! Happy Baking! No kidding! But you know through simple mathematics it makes sense! 0 + 0 = Deliciousness! SO hope you enjoy! Yay Whole Foods for giving great recipe inspirations! I always read your recipe and these all are very good and fruitful .I have made with this recipe, it was really delicious thank you for sharing your experience. So dang good to hear!